This is the first post in our Rufflicous series! Everyone knows there's more than one way to skin a cat-- and sewing is no different. Each day this week I'll cover one ruffling method, when to use it and when not to use it, and when to avoid it like the plague. To keep things simple we'll only discuss methods that use a sewing machine and thread-- no sergers, special feet or hand sewing required..
Today we are going to look at the Traditional or Old Fashioned Ruffling Method. 1. 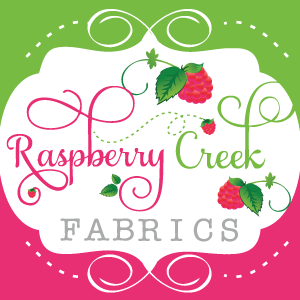 Set your machine to the longest stitch and pull out 6-8 inches of bobbin and needle thread. 2. Sew 2-3 lines of stitching along the area to be ruffled making sure to leave a long thread tail at each end of each line of stitching. These are your basting stitches. Grab your needle threads and gently pull to gather the fabric. Although the gathers will have to be top stitched to make sure they stay in place, I like to tie all the threads on each side together at this point to prevent them being from pulled out. Both sewing and adjusting the gathers is time consuming. It's difficult to get a large amount of ruffles (for example, ruffling a strip of fabric to 1/3 or 1/4 it's original length. This isn't one of my favorite methods, mostly because it takes so much time. I'll only use it when the fabric length is less then 6-10 inches. This is my preferred method for small bits of gathering that will be the feature of a project, like gathered pockets or a neckline. I can hand adjust the gathers until the ruffle looks perfect and is precisely the size I need it to be. 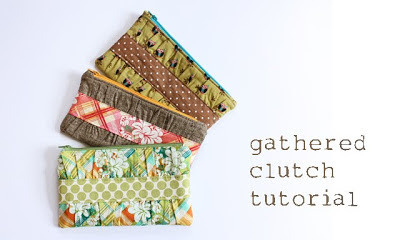 My absolute favorite project using this method is Noodlehead's famous Gathered Clutch Tutorial. This little pouch comes together very quickly, and it's a fun way to showcase a bit of ruffles without being too frilly. See you tomorrow when we talk about tension ruffling! Looking forward to the rest of this series! I really like the way you structured this post, with the pros/cons, when to use and try it out sections.